I should have known. Or at least…i could have known. From the moment the first snowflake fell on German soil, all hopes of a normal trouble-free trip by train were lost. Deutsche Bahn is as famous (and notorious) for its delays during snowfall as for its punctuality during the rest of the year..
As is always the case in those difficult travelling times, people started to flock together. It seems to be a general natural law that humans, when in railway limbo (or any other form of transportational trouble) , flock. Like birds. They do so because it is comforting to hear other stories and know that it can always be worse. Like the man who was on his way from Maastricht to Köln, and had spent the last six hours on the rails on the 150 km that separate those two cities.. or the old lady and her husband, on their way to Berlin to visit their grandchildren (by train, for old time sake). I, on the other hand, was still on schedule. My train to Kopenhagen was not going to arrive for another four hours, so I made a short walk through town, visited the Christmas market (where a local singer was singing her Christmas carols out loud, but quite out of tune) checking the departure board every now and then for news. The news came, but a little late. By the time the 447 service to Warsawa/Praha/Kobenhaven was on the board it was 20 minutes before its’ scheduled arrival. It came up…cancelled…. For these kind of festive occasions, Deutsche Bahn has invented a truly devilish instrument: the ServicePoint. Inhabited by grunting red-hatted people with a zombie-like look in their eyes and painfully slow movements, these cubicles are there for your general annoyance. They are the perfect instrument of torture. As a queue of angry and distressed travellers forms in front, and it is finally your turn to ask your question after half an hour of waiting, they suddenly decide to leave the cubicle and go for a pork sandwich, throwing a “Geschlossen” sign on their desk just before they lock the door upon the last remaining staff member (usually a trainee or zombie-in-waiting, typically the youngest of the horde), who finds himself attacked by a queue double the size. Sadly, the younger staff can’t take weighty decisions, such as “can we make that train wait just a few minutes so all the people here can get in and reach their destination?”. Therefore, he has a direct phone connection to the senior staff members for help, but they don’t reply as they are eating their sandwich (nice to see there is still some basic logic left after all). After a few awkward minutes during which the man behind the desk was confused because he couldn’t find my train in the computer (it said “no”) I pointed to the departure table, where the truth stood spelled out in shiny blue and white letters. One phone call later I was on the train to Dortmund where, sure enough, stood the night train to Kopenhagen. The one hour delay became a two hour delay due to snow and thanks to shunting problems in Hannover, a three hour delay. Once the train had reached Denmark and was left in the hands of Danish staff and engines, everything went like clockwork again. There are some magnificent views to be found along the road, however. The Rendsburg High Bridge, for example, which is so high the train must make a few miles of loop around Rendsburg before it can call at Rendsburg station. While it steadily climbs the slope towards the bridge, you can see the monster of steel in the mist behind a city where only a few street lamps tell you the city is alive under its’ cover of snow. And of course, the Great Belt Bridge, spanning the Great Belt (the strait between the Kattegat and the East Sea) and the only road connection into Zealand island from mainland Denmark . 2500 km across Europe in three trains. As i mentioned before, i like travelling by train. 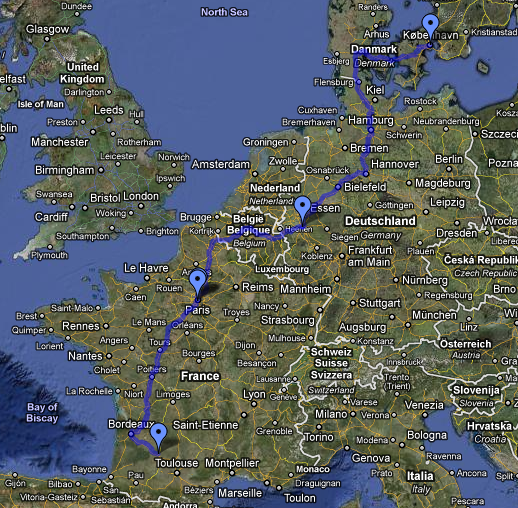 In two weeks i will try to cross Europe from Copenhagen (Denmark) to Agen in the south of France through Cologne and Paris in 24 hours. (23h43 actually, but never mind that). Last year my train had no heating and broke down along the way to Berlin, so i’m eager to know what awaits me this year. However, i’ve taken my precautions. Instead of a rather unhealthily short one hour time window between two trains in Cologne like last year, i have a comfortable 2.5 hour gap to catch up with any delays i might encounter, and arrive safely on time for my high-speed connection to Paris. I’m very fond of train travel. In fact, i rarely use any other means of transport on distances longer than a few kilometers, unless there really is no other option. I would have gone to China by train if it wouldn’t take me 8 days to get there (and 8 days to come back, of course) and if I had had some more weeks of holidays to spare. Over the past 16 months, i’ve travelled 52,000 km by train, of which 24,000 were travelled on the 55 kilometer stretch of railway between home and work, 14000 on the 350 km TGV line between Brussels and Paris,and 6000 km within China. The remaining mileage was spent entirely on European railways, with a few escapades to France, Germany and Italy along the way. Of course, this has meant I’ve had my fair share of delays, strikes and other problems along the way. But that really isn’t the point. Any means of transport is subject to those troubles, and after all travelling IS meant to be a bit adventurous . But by train, you can just sit back and enjoy the scenery, as it glides past your window. There is one kind of train in particular that brings back the mythical railway experience and still has a hint of the good old Express-feeling: The international intercity night train. France still has a national night train network, and a few trains from Paris still go across borders to Spain and Italy, but the times when you could travel from Paris to, say, Budapest without changing trains are over. What remains until this day is a network of trains between mainly Switzerland, Germany and Austria called City Night Line, run by Deutsche Bahn. It is, without any doubt, the most thrilling kind of railway travelling you can do within Europe, but sadly enough a fading remnant of what it once was in the glory days of nightly travel. Last Christmas, when temperatures hit -16°C in Belgium, France and Germany, i tempted fate, and boarded the Paris-Moscow ‘Perseus’ service to go to Berlin with my girlfriend. Yes, there still is such a thing as a Paris-Moscow train, although it is reduced to one sleeper carriage, pulled by the Paris-Berlin/Munich train, and coupled to the Berlin-Moscow train in Berlin Ostbahnhof . It will take you 48 hours and the train will need to change tracks at the Russian border, as the distance between both rails doesn’t match, but it will take you through the Rhine Valley, the Schwarzwald, the remnants of East Germany, and the icy steppes of Poland, Belarus and Russia. But we were getting out at Berlin. Or were we? As the train rolled out of Paris-Est station, it soon became clear the heating wasn’t working in our carriage which, with the snow outside and temperatures below -12°C, wasn’t that promising a prospect. By the time we arrived at Strasbourg a thin layer of ice had formed on the windows, and most of the people on the train had frozen feet, pacing up and down the train to look for a spot where the heating was still on. Ironically, the (empty) Moscow-bound carriage was the only one that had some form of heating, which led to a fierce competition to conquer a spot in the corridor. The rest of the people, such as ourselves, had to find more innovative ways to unfreeze, such as exchanging spare pairs of socks and blankets. As the engine wasn’t powerful enough to make the heating work it also had some problems pulling the train, and soon we were running two hours late. German railways efficiency came into play, and we were given the authorization to get off in Mannheim and upgrade without any cost to the posh luxury of the German high-speed service, the ICE. For those who are unfamiliar with the ICE, i can only tell you to try it some day, as it is a refreshing experience. Coffee and newspapers are served at your seat (yes, in second class), the train interior looks like a futuristic rolling version of the Ritz lobby, and once inside you can’t hear the outside world. It’s like the Starship Enterprise, on rails. And it also runs on time, which is quite a unique experience for people used to Belgian and French railways. The train manager on the Mannheim-Hannover ICE was ‘really sorry for the delay of about 1.5 minutes’. Our luck had soon run out, however, as the Hannover-Berlin train got stuck behind a night train that had broken down further down the road and had to wait in case the stranded passengers on the other train had to be evacuated by ours. For one hour we waited as the railway engineers tried to start up its’ engines to clear the rails. And when they finally abandoned, and our train could continue on the other tracks, we could make out the letters painted on the side of the immobilized carriages we sped past.